Back in August last year we let you know about the launch of the new GS, and since then we’ve been keeping you in the loop on all the GS model launches: the GS 450h at the Frankfurt motor show, the GS F Sport at SEMA and the GS 250 at the Guangzhou motor show. Now we can bring all you GS fans some further news, as Lexus has just released the prices for the entire new GS range in the UK. And it’s good news indeed: the prices start at £33,495 for GS 300h SE, going up to £50,995 for the GS 450h Premier and £49,995 for the GS 450h F Sport. Powered by a 206bhp (154kW) 2.5-litre V6 Dual VVT-i petrol engine, the GS 250 SE’s specification includes 17-inch alloy wheels, automatic bi-xenon headlamps and windscreen wipers, LED daytime running lights and a rear-view camera with parking guide monitor. Cabin comfort is assured with leather upholstery, dual-zone climate control and electrically adjustable front seats (10-way, with memory setting for the driver’s seat) with heating and ventilation functions. The steering wheel is electrically adjustable, too, and incorporates paddle shifts. On-board entertainment is provided by a 12-speaker audio system with CD player, DAB tuner, Bluetooth and USB/Aux ports for connecting personal music players. The Luxury grade builds on the SE specification with the introduction of 18-inch alloys, front and rear parking sensors, an auto-dimming rear-view mirror and an HDD satellite navigation system with Remote Touch controller. The Luxury grade also provides a new blind spot detection system integrated into the folding/auto-dimming door mirrors. F Sport versions of GS make a bolder style statement thanks to 19-inch rims, a boot-lip spoiler and sports-styled bumpers and front grille. The F Sport look carries through to the cabin with sports pedals and perforated leather-trimmed sports steering wheel and gear knob. The front sports seats gain further adjustment functions – 16-way for the driver, plus four-way lumbar support. The F Sport grade benefits from Adaptive Variable Suspension and selectable drive modes plus, on the GS 450h model, the Lexus Dynamic Handling System, which brings together a comprehensive array of steering and handling features, including Dynamic Rear Steering, electric power steering, Variable Gear Ratio Steering and Vehicle Dynamics Integrated Management. At the top of the range, the GS 450h Premier is fitted with 18-spoke, 18-inch alloy wheels and the same bi-xenon headlamp system and adaptive suspension and selectable drive modes as the F Sport models. In the cabin the seats are upholstered in semi-aniline leather, with both front seats benefiting from 18-way electric adjustment and memory settings. The passenger seat offers extra leg support and a rear easy access function. The sophisticated climate control system is divided three-ways between the front left and right and rear sections of the cabin, and is equipped with an ioniser to help maintain an ideal environment. The HDD navigation and premium Mark Levinson sound system are linked to a 12.3-inch central display screen, the largest on the market. Nine exterior colours are available for SE, Luxury and Premier models: Arctic Pearl, Sonic Silver, Velvet Black, Mercury Grey, Meteor Blue, Crimson Red, Atlantic Blue, Celestial Black and, for GS 450h only, Obsidian Black. The F Sport models have a different range of colours: Arctic Pearl, Sonic Silver, Velvet Black, Mercury Grey and Crimson Red, as well as six leather colours with a Garnet red exclusive to the F Sport. The GS is available to order now, with first customer deliveries from mid-June. 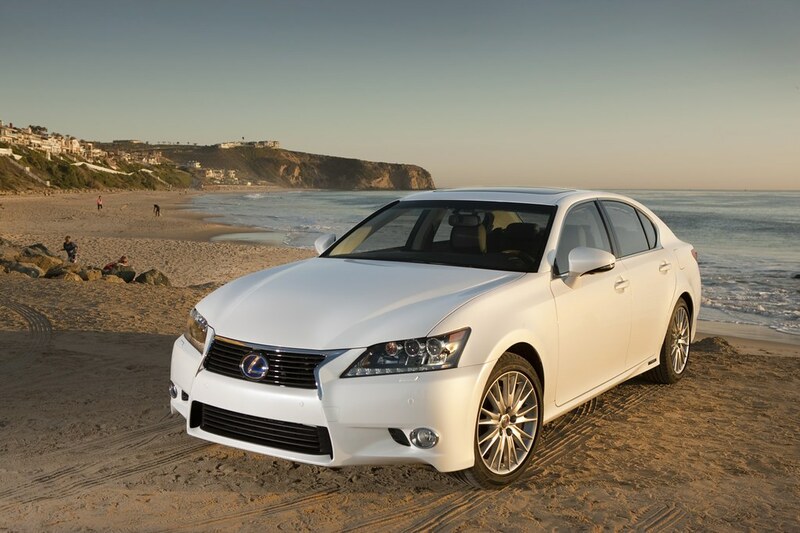 For all the latest GS and Lexus news, check out the Facebook page, our Twitter feed and the Lexus blog. Might want to correct Topgear’s magazine/online review (http://www.topgear.com/uk/lexus/gs-450h/road-test/f-sport-driven) they seemed to like it but thought it cost 70k which reflected in the low overall score. . . typical lazy journalism, and went online on the day prices were released. Thank you for your message and noticing the mistake, we have already contacted the guys at Top Gear and hope to have the issue corrected ASAP.